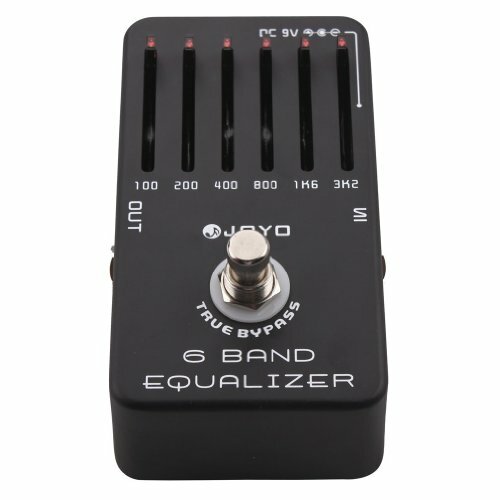 Joyo Audio's 6-band EQ offers the kind of musical control every guitar or bass player dreams of having over their tone. But most amps only offer a 3-band (Low, Mid, High) frequency control. Well, the day has arrived where any musician can afford to have their signal sculpted with reliability and accuracy. With tone centers at the most useful frequencies for guitar (but also suitable for Bass, Keyboard and Electric Violin), the JF-11 allows you to develop your sound. The coolest thing you can do with these pedals is create dual tonalities (EQ off and EQ on). Some songs may call for a bit more sparkle, so use them only on those. Or you may find that you like your distortion pedal's Tone cranked up real high to get every last bit of gain out of it, but in this case the mids can become too harsh or the bottom end gets lost. Well, with Joyo's 6-band EQ pedal, this is no longer a problem in the slightest. You can give deep low end an incredible 18 dB increase, but at the same time control the rumble by taming the upper-lows and low-mids a bit. There's something to mention here about the pedal when it comes to using simultaneously with other pedals, there is a new device on the market which allows combinations of pedals to be turned on or Off simultaneously. This means if you love to hear this pedal matched with your favorite distortion pedal, to achieve whatever signature lead sound it is you're going for, then you can do that with the PXL-8 Multi-effects Routing Device, Individual Control / Selector; priced around 200 combine, what a versatile and affordable combo. The fun has just begun when you get a JF-11 and start creating your own signature sound. The crowd will thank you with their smiles and cheers, for you know on that night, you'll leave all w/ happy (not bleeding) ears! If you have any questions about this product by CBD Tenchology, contact us by completing and submitting the form below. If you are looking for a specif part number, please include it with your message.